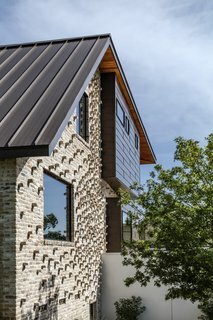 Matt Fajkus Architecture undertakes a mullet renovation of a 1938 bungalow in the Clarksville Historic District, leaving only the facade. 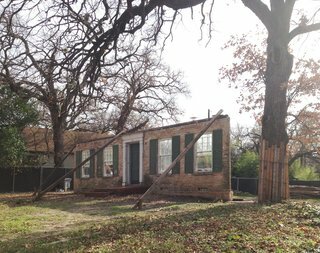 Clarksville Historic District in Austin, Texas, was founded by Charles Clark, a former slave, in 1871, and is now the oldest surviving freedman’s town. 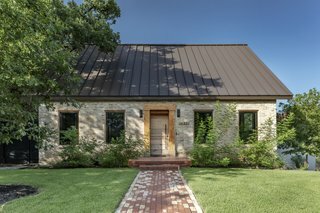 As part of this historic community, a neglected 1938 bungalow could not be removed, so Matt Fajkus Architecture got approval from Austin’s Historic Landmark Commission to preserve the home’s front facade while renovating the rest. 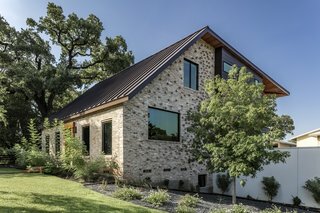 The firm worked with the Old West Austin Neighborhood Association to salvage bricks from the torn-down house and repurpose them on the exterior. Framing lumber was also reclaimed from the original house for the interiors. 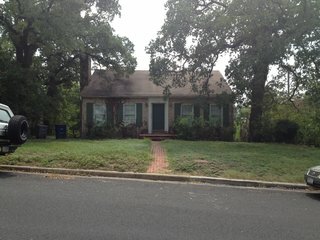 Before: the original, modest bungalow was historic but had suffered from years of neglect. Before: following the demolition of the original home, only the front facade remained. 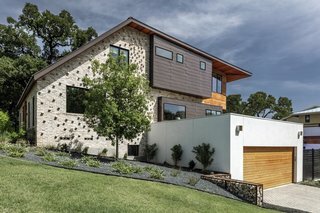 The original facade was transformed into a contemporary profile that pays homage to the home's humble roots. Bricks from the original bungalow were salvaged and repurposed. A close-up of the brickwork which is broken up by the unique, randomized brick coursing to help blend old and new bricks. 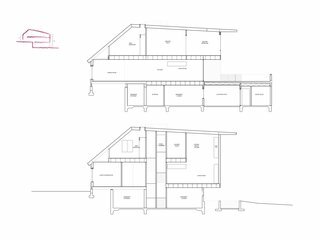 The design of the remodel negotiates a 12-foot drop from the front of the lot to the back with a modified roof form that allows for three stories. 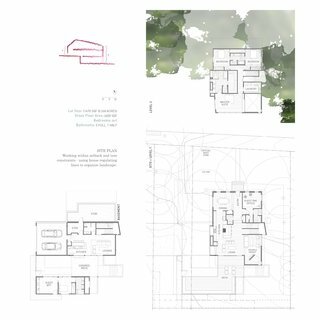 The entry sequence starts with a humble and compressed space that expands upon entry. 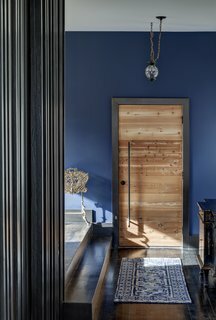 The front door is made of repurposed wood. 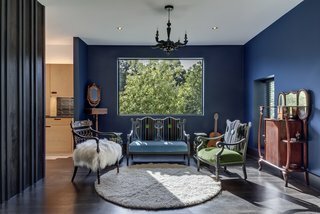 The sitting area is finished with dark surfaces and heavy, antique furnishings. 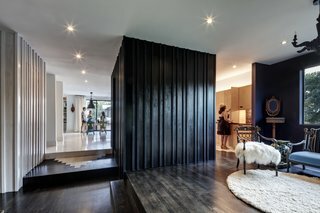 Black walls were used to create contrast, and the black board-and-batten box is the powder room that separates the kitchen and the hallway with a glimpse of the living area beyond. 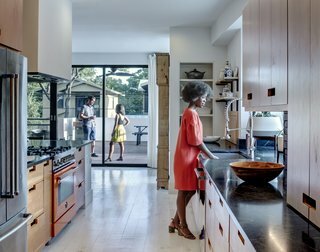 The kitchen, living, and dining areas extend out to the exterior deck. The kitchen extends out to the deck. 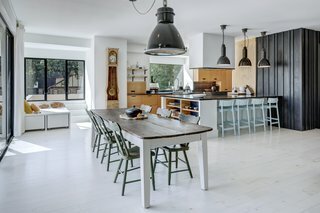 The opposite view of the kitchen. 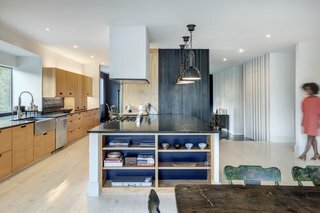 A dead tree on the lot was milled to construct the dining table, further connecting the newly designed home to its historic community. A reading nook fits perfectly into one of the cantilevered boxes. A double-height graffiti wall is bathed in natural light. 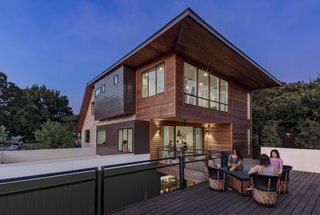 The mullet design provides ample outdoor entertaining space for social gatherings. 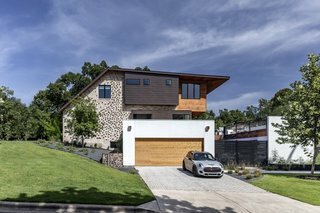 Overall, the design strove to preserve some of the character of the original front facade while allowing a contemporary structure to unfold. Interior Design: McCray & Co.